While I mourn over yesterday's defeat of Portugal in Euro 2008, I present to you another free football/soccer Wink provided by Quebles, where Winks normally set you back €1.30. Consisting of a bouncing ball, cheering in the background and a voice shouting GOAL, it's universally usable during any game and any cup. 1) Go to this site. 2) Enter your (or any) e-mail address in the field after "E-mail"
3) Select "Voeg me niet toe!" if you don't want to receive mailings from Quebles. 5) On the next screen, click the Download button. 6) Open a conversation window in MSN/Windows Live Messenger and you'll find the Goal Wink under "Recently used winks" in the Winks dropdown menu. This month's evil word -according to the Microsoft partner responsible for the SPIM filter- is setup.exe. Go try and send it to one of your contacts. Any message containing "setup.exe", regardless what comes before or after, will be blocked. While you get the explanatory error message in official Windows Live Messenger releases, the Windows Live Messenger 9.0 Beta makes it dissolve into thin air meaning you won't see setup.exe in the conversation area after you hit enter (but with the Beta soon closed, it's too late for a bug report). Too bad for "ze French Messeurs" but Italy kicked "Les Bleus" out of Euro 2008 last night. As you can guess, I've turned Italy's two important goals into animated display pictures for Windows Live Messenger 9.0. The Dutch team continued their winning streak ("Ehh.. What group of death?") so here's another special for the Orange-coloured fans. It's a set of display pictures derived from the works of Dutch photographer Erwin Olaf (found them at WorldCupBlog.org). The series is called New Warriors and seems to be inspired by the Spartans in Frank Miller's 300. >> Check Erwin Olaf's incredible portfolio. For those with a Doctor Frankenstein propensity here's a good tip from senior Messer, MNeMiC. If you like the idea of creating hideous monsters and then using them as animated emoticons or display pictures in Windows Live Messenger, you should grab a copy of the just released Spore Creature Creator and start modelling. You can then import them as custom emoticons or -and that's where they look best- drag & drop the files onto your current display picture to use them as avatars (they'll only animate in Windows Live Messenger 9.0, mind). Have fun, doc! >> Download Spore Creature Creator (free trial, requires DirectX 9.23). >> Upload your Spore Creatures and make them join my yellow "Mess Monster". 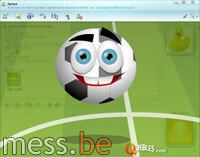 More animated avatars for Windows Live Messenger 9.0, including the three incredible comeback goals by Turkey last night. And I can't seem to make a Euro 2008 post without mentioning the Dutch team. Chuck's Wink Workshop allows supporters of the Netherlands to make a cheering EK Wink personalized with anyone's face. The graphics and execution are rather poor (it didn't even show my chosen picture when I tried it), but here's the link for die-hard fans. This interoperability deal between Google and Yahoo! makes you wonder, will Yahoo! Messenger become a bridge between Google Talk and Windows Live Messenger? In any event, Yahoo! Messenger is on its way to become the client of choice for those with cross-network buddies. >> Yahoo! Messenger <3 Google Talk. >> Yahoo! Messenger <3 Windows Live Messenger.